BlackBerry's found itself in some tough financial shape lately, and just about a month ago shared word of its recent quarterly loss. In spite of such setbacks, company CEO John Chen remains nothing short of optimistic for BlackBerry's future, especially when that comes to remaining in the smartphone hardware business. Those Q4 fiscal 2016 losses were punctuated by some less-than-stellar (to put it mildly) sales of the Android-running BlackBerry Priv, the manufacturer's big flagship from last year: BlackBerry moved only 600,000 units during the quarter. At the time, Chen expressed his desire to keep BlackBerry in the phone-making business, but resigned himself to the fact that if his company couldn't find a way to profit on phones soon, it might have to shift its focus to software and service. 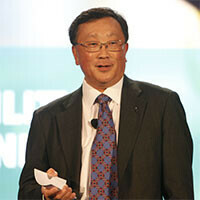 Now in a new CNBC interview, Chen sounds a bit more positive about BlackBerry's hardware outlook. While repeating his earlier statement about a return to hardware profitability being key, Chen says that he's now “very close” to getting the company there, and that he “truly believes” that BlackBerry will remain in the business of making smartphones. Chen once again confirms plans to release two new BlackBerry phones later this year, but it's clear that his ambitions reach even further. Beyond those, he tells CNBC's Brian Sullivan that there's “absolutely” a hardware plan that looks past even that pair of devices. But for details on whatever those future phones will bring, we'll just have to keep waiting. Gotta love Chen's optimistic, never say die attitude! But he's also realistic, noting his fiduciary responsibility to the shareholders in that if he can't make money with handsets, he'll pull out of it altogether. Hopefully, Chen will make the handset division profitable again, as he says he's very close to doing so. If for whatever reason he can't, at least BlackBerry will go out swinging, and they'll still be around as a software and services company. Agreed! Gotta love Chen's always Positive, never give in attitude. I'm a firm believer that Chen can turn around the hardware division. If he can price those two new devices between $300-$400 with one of them in the $300-$349 price range and market it correctly with good specs then it can indeed happen. $399 and $299 are the magic numbers. Not sure what the margins look like on that. Chen said they need to sell 3 million handsets a year @ an asp of $300 or so for profitability. If we knew the manufacturing costs, we could figure out the margins. Well, one of the new phones to be released was said to be higher-spec'd with a price tag of around $500. Maybe that's it. Or maybe what BlackBerry deems as profitable for them in hardware is considerably less than others. Indeed. Totally agree. And you know, if Chen achieves profitability with BlackBerry's handset division, I wonder what excuse people will come up with to doubt what BlackBerry is capable of next? Doesn't he say that every year? Every year. Like clockwork. It's kind of like those post interviews they do with NBA, NFL, MLB players and UFC fighters. They ask them the same questions and they give the same answers "I owe it to the fans, I wanna thank god, my coaches, my teammates, I would like to thank my sponsors". It's the same thing....just with this line of work we get to see numbers and sales reports. They can't just admit failure and go with numbers. He promised certain things and failed to deliver. So they have to throw it under the rug for PR purposes. Just go back and follow Chen and read the paper trail he left behind. Read the things he said with the same "positive optimism" he spoke with. Chen and Joe Belfiore must be best friends. Chen is in denial. He's had several chances to turn blackberry around and so far he hasn't done it. The $700 Priv is proof of that. He needs to get out of the past. Don't all companies having smartphone woes say the same thing? LG, Motorola, HTC, Sony....even Microsoft, to an extent, have all said something similar. Should they not? Should they all just give up and exit the smartphone business? Or should they keep on going with their "positivity" and "optimistic" views, especially if they really are close to achieving their goals? No it doesn't. Stop making excuses. They've all said something similar. You were. You always do Michelle. They're ALL in the same circumstance. You're making excuses now. No, that would be you, meanest. No excuses being made at all, just a point. Nah, you're making excuses. As usual. That would be you, as you can see above. No, you're deflecting, projecting and making excuses. That's your M.O. "I'm using a BlackBerry Z30 too and it's the best." Well then.